Two weeks after torching the Canada West Track and Field Championships in Edmonton, third-year sprinter Austin Cole turned in a historic performance at the U SPORTS Championships in Winnipeg. Cole added to his already illustrious career with three more medals at the 2019 national championship, while also shattering his national 300 metre record. One year after setting the U SPORTS 300m record with a time of 33.37, Cole turned it up another notch this past weekend. His time of 32.89 set a new U SPORTS and U23 Canadian record and also earned him his third straight national title in the event. Cole added to his medal haul on Saturday with a silver medal in the 4x400m relay, and a bronze medal in the 4x200m relay. In three seasons, Cole has racked up nine U SPORTS medals. Prior to the championship, Cole was also awarded the U SPORTS 2019 Male Track Athlete of the Year. Leading the Golden Bears to a Western Regional Championship win over UBC, second-year Bear Max Szczypien is the Sherlock Holmes Athlete of the Week. Szczypien went undefeated in the Western Championship against UBC, earning a decisive doubles win with Connor Khademazad, before winning the No. 1 singles match in straight sets. The win is the Bears 13th consecutive Western Canadian title. Szczypien and Khademazad earned the winning point for the Bears in doubles, finishing off the Thunderbird duo of Alexandr Kim and Dickson Zhaung 8-6. He then followed that up with an impressive performance in the top singles match, defeating Wesley Bertsch 6-4, 6-3. Szczypien and the Golden Bears will now head to the Tennis Canada National Championship, which will run in August in Montreal, Quebec. Game log: Friday, February 22 – 17 save shutout in 2-0 Game 1 home win over Saskatchewan / Saturday, February 23 – 24 saves in 2-1 Game 2 home win over Saskatchewan. After one competing the best season of her young career, third-year Alberta Pandas goalie Kirsten Chamberlin continued her hot play, leading Alberta to a semifinal sweep over Saskatchewan. Chamberlin made 41 combined saves over two games, as the U SPORTS No. 1 ranked Pandas swept the UofS Huskies 2-0 in their semifinal series in Edmonton. With the win, the Pandas will host the Canada West Final for the first time since winning their last title in 2015. Chamberlin was sensational in the Pandas 2-0 Game 1 win, finishing with a 17-save shutout. The highlight of her performance came in the first period, as they stopped the Huskies on a four-minute powerplay. The Calgary, Alberta product was just as stellar in Game 2, turning aside 24 of the 25 shots she faced in the Pandas 2-1 win. In seven career playoff games, Chamberlin holds a 5-0-2 record with a 0.84 goals against average and 0.956 save percentage. Chamberlin finished the regular season with an 11-0-0 record and a conference-best six shutouts. The No. 1 Pandas will host the No. 2 Manitoba Bisons in the conference final, which gets underway on Friday night at Clare Drake Arena. Game log: Nine points, four rebounds, and four assists in 76-75 home loss to Lethbridge in Game 1/ 18 points, six rebounds and one assist in 86-70 home win over Lethbridge in Game 2/ 18 points, four assists, three rebounds and two steals in 86-68 home win over Lethbridge in Game 3. Coming up with one of his most clutch performances of the season, fourth-year Golden Bears guard Ivan Ikomey has been named the Sherlock Holmes Athlete of the Week after leading the Bears to a quarter-final win over the Lethbridge Pronghorns. The sharp-shooter finished the weekend with nine three-pointers and 45 points, as the Golden Bears advanced to their third-straight semifinal appearance after a 2-1 series win over Lethbridge. After the Bears fell 76-75 in Game 1, the Bears bounced back with an 86-70 win on Friday night in Game 2, thanks to a team-high 18 points on 6-8 shooting from Ikomey. He also added six rebounds and one steal in the convincing win. The Calgary, AB product was just as efficient in the winner-take-all Game 3, finishing with another 18 points on 4/8 shooting, with four three-pointers and six free throw makes. He also added four assists and three rebounds. The No. 5 ranked Golden Bears will host the No. 6 UBC Thunderbirds this weekend, with the winner advancing to the conference final, and earning a spot at the 2019 U SPORTS National Championship. Game log: Canada West Wrestling Championship - Gold Medal in women’s 59 kg weight class, Co-Wrestler of the Year. Leading the Pandas to their second-straight top-two finish at Canada West, fifth-year wrestler Krystin Paquette finished her Canada West career with one of her most dominant performances. Paquette went undefeated in the women’s 59 kilogram weight class in Abbotsford, claiming both the conference gold medal, while also being the co-Female Wrestler of the Year. The Murillo, Ontario product defeated Saskatchewan Huskie Emma Parker 4-2, before topping Calgary Dino Amy Bellavia 7-5 over the weekend. Thanks to her gold medal, the Pandas were able to finish second to Saskatchewan in the team standings, which represents their ninth-straight year placing inside the Top 3 in Canada West. Over her five year career, Paquette now owns four Canada West medals, including gold medals in 2018 and 2019. Paquette and the Pandas will look for more team success in two weeks, as they head down to Calgary for the 2019 U SPORTS Wrestling Championships at the University of Calgary. Making his final statement in his quest to be named the CW Player of the Year, fourth-year Bear Brody Clarke led the Bears to an upset sweep over UBC with a monster weekend. Clarke finished his weekend with 58 points, 19 rebounds and seven assists, as the No. 6 ranked Bears swept the No. 4 ranked Thunderbirds in Edmonton. The Toronto, Ontario product led the Bears with 18 points and eight rebounds on Friday in their 10-point win over UBC. He then followed that up with one of the best games in program history on Saturday. Clarke finished with a career-high 40 points on 15/18 shooting, becoming just the fifth Bear even to score 40 in a game, and the first since 2008. He also added 11 rebounds and four steals, recording his conference-best 14th double-double. Clarke finished the season second in conference scoring with 19.8 points per game, while leading U SPORTS with 11.0 rebounds per game. The second-seeded Bears will get a bye through this weekend’s play-in-series, before hosting a CW quarter-final from February 14-16. Game log: Friday, January 25 – Four goals, six shots and +2 rating in 6-3 road win over Regina / Saturday, January 26 – Two assists, five shots and +2 rating in 7-1 road win over Regina. In one of the most dominant performances of the season, third-year Golden Bears forward Luke Philp powered Alberta to a series sweep over Regina with a six-point weekend. Philp scored four goals in Friday’s 6-3 road win over Regina, before adding two assists in their 7-1 win on Saturday. The third-year Bear also added 11 shots and a +4 rating over the weekend, as the Bears earned their 8th and 9th straight wins. Friday’s offensive explosion represented a career-high for Philp with four goals in one game, becoming the first Bear since 2013 to reach the mark. During his current seven-game point streak, the former Kootenay Ice forward has 11 goals and 17 points. Through 20 conference games, Philp leads Canada West with 20 goals and 37 points, and has a six-point lead in the CW scoring race. He is also the first Bear with 20 goals in conference play since Ryan Wade in 2004. The Golden Bears will look to add to their win streak this weekend, as they host the U Cup host Lethbridge Pronghorns at Clare Drake Arena. For the second time in three weeks, third-year Pandas guard Emma Kary exploded offensively in a series sweep for Alberta, and has been named the Sherlock Holmes Athlete of the Week. Kary combined to score 45 points in back-to-back wins over UNBC, while also adding 17 rebounds, six assists and four steals. The pair of wins extends Alberta’s win streak to 12, as they sit in a tie for first in Canada West with a 14-2 record. Kary had an impact at both ends of the court in their 86-72 win on Friday, finishing with 16 points and six rebounds. She followed that up with a career performance on Saturday, finishing with a career-high 29 points on 12/21 shooting, adding nine boards, three assists and two steals. Following the outstanding weekend, Kary has jumped into ninth in Canada West scoring at 17.3 points per game. Kary and the Pandas will face their toughest test this weekend, as they face the 14-2 Saskatchewan Huskies in a battle of the top two teams in Saskatoon. Putting forth one of his best weekends of the season, second-year Golden Bears goalie Zach Sawchenkoled Alberta to a series sweep over UBC in Vancouver. Sawchenko allowed just two goals across 129 minutes, as the Golden Bears were able to extend their winning streak to five thanks to a pair of wins over the Thunderbirds. The Calgary, Alta. product made 26 saves on 28 shots on Friday night, as the Bears escaped with a thrilling 3-2 double overtime win. Sawchenko then added 17 saves on Saturday, earning his third shutout of the season. The win was also his fourth-straight, a streak dating back to December. In 15 games this season, the sophomore Bear leads Canada West with a 1.71 goals against average, while sitting second in wins (12) and shutouts (3), and third in save percentage (.916). The 16-3-1 Golden Bears will look to add to their winning streak this weekend, as they take on 11-5-4 Mount Royal Cougars in a home-and-home series. With one of the most dominant weekends of her career, third-year guard Emma Kary powered the Pandas basketball team to a home sweep over the visiting Manitoba Bisons. Kary finished the weekend with 43 points, 19 rebounds and four steals, as the Pandas extended their conference winning streak to eight games. Their 10-2 record is the third-best in Canada West, behind only Calgary and Saskatchewan. Kary was incredibly efficient in Friday night’s win, scoring 19 points on just 13 shots, adding seven rebounds, two steals and two assists in the Pandas 20-point win. The third-year guard was excellent on Saturday, pouring in a game-high 24 points on 11/18 shooting, also adding a game-high 12 rebounds. The Calgary product also chipped in two steals and an assist in the Pandas 12-point win. The Pandas will look to add to their lengthy winning streak this weekend, as they travel to Brandon to take on the Bobcats. In one of his best weekends as a Golden Bear, fourth-year forward Brody Clarke led his team to a series sweep of the Thompson Rivers WolfPack in Kamloops. Because of his stellar performance, Clarke was named the Sherlock Holmes Athlete of the Week. The Toronto, ON product was incredibly efficient on Friday night, finishing with 20 points on 7-11 shooting, adding five boards and one steal. Clarke was utterly dominant on Saturday, finishing with a season-high 30 points, while also adding 14 rebounds, two assists and two blocks. 14 of his points came in the second half, as he also helped the Bears erase a third-quarter deficit. In an authoritative series sweep over the No. 6 ranked Calgary Dinos, Luke Philp led the No. 3 ranked Alberta Golden Bears to a pair of decisive wins this past weekend. Philp finished the weekend with six points, including a five-point outburst in their 8-0 win on Saturday in Calgary. Alberta outscored Calgary 14-2 in two games, leapfrogging their provincial rivals into second place in Canada West. The third-year Bears forward recorded one assist on Friday in their 6-2 win, before recording his first hat-trick of the season on Saturday, while also adding a pair of assists. Despite missing four games with injury this season, Philp now leads Canada West with 17 points in 10 conference games. The third-ranked Golden Bears will face another stiff test this weekend, as they travel to Saskatoon to take on the conference-leading, and No. 2 ranked Saskatchewan Huskies. Third-year setter Max Elgert tallied 107 assists in nine sets, leading the Golden Bears volleyball team to a weekend sweep of the Manitoba Bisons this past weekend. Because of his outstanding weekend, Elgert was named the Sherlock Holmes Athlete of the Week. Elgert paced the Bears offence with 54 assists six digs and three blocks on Friday, leading them to a thrilling 3-2 win over the Bisons in Winnipeg. He followed up that performance with another 53 assists and four digs in Saturday’s 3-1 win. It also marked his third-straight game with more than 50 assists. The Golden Bears have now won five-straight conference matches, as they lead Canada West with a 9-1 record. Following his stellar weekend, Elgert also now leads Canada West with 417 assists through 10 games. The Golden Bears will get a ‘bye’ this weekend, before hosting the Thompson Rivers WolfPack during the November 30thweekend. The Pandas Hockey team added to their conference win-streak with a series sweep of Regina, thanks in large part to a six-point weekend from fourth-year Panda Alex Poznikoff. Poznikoff recorded one goal and five assists in two Pandas wins, as Alberta outscored Regina 9-0 in the sweep. With the stellar performance, Poznikoff has also jumped atop the conference scoring race with 16 points in 10 Canada West games. The Edmonton, Alta. product recorded a point on each of the Pandas four goals in their 4-0 win on Friday, recording three assists and one goal. She then added another two assists in Saturday’s 5-0 win over the Cougars. Alberta leads Canada West with a 7-2-1-0 record and 23 points in 10 games, and have now won four straight games. The Pandas will return home this weekend, as they host the Lethbridge Pronghorns at Clare Drake Arena. Second-year Pandas swimmer Ranae Ledoux is the Sherlock Holmes Athlete of the Week after a stellar performance this past weekend in Vancouver. Leading the Pandas at the Oldum Brown Colleges Cup in B.C., Ledoux finished with two medals and four top-10 finishes, as the Pandas earned a sixth place team finish. Ledoux earned her first medal in the 50 meter breaststroke, finishing third with a time of 33:09, less than one second behind teammate Madalyn Smith, who earned a silver. The Langley, BC native captured her second medal of the meet in the women's 200m breast, placing second with a swim of 2:33.05. She also earned a fourth-place finish in the 100m breaststroke (1:11.21), and a seventh place finish in the 400m freestyle relay (4:00.09). Ledoux and the Pandas will be back in action later this month, as they travel to Calgary for the 2018 Canada West Championship. After leading the Pandas to a thrilling quarter-final win over their rival MacEwan Griffins on Sunday, fifth-year Pandas striker Karissa McNutt has been named the Sherlock Holmes Athlete of the Week. McNutt, who was subbed into the match to start the second half, scored both goals for the Pandas in their 2-1 win over the Griffins. The win also sent the Pandas to their first Canada West semifinal since 2014, and marked the final game for McNutt at Foote Field after a five-year career with the Pandas. The Edmonton product opened the scoring in the 76th minute, blowing an absolute rocket over MacEwan keeper Emily Burns into the top corner. After MacEwan tied the game at one in the 82nd, McNutt scored the game-winner in the 89th, as her shot ricocheted of a Griffin defender and past Burns. The Pandas will now head to Langley for the Canada West Final Four, where they will meet the Trinity Western Spartans in the conference semifinal. A win in the semifinal would also send the Pandas to their first U SPORTS Championship since a third-place finish in 2013. Mariah Walsh’s return to the Pandas volleyball team couldn’t have begun much better, as the fifth-year setter led a potent Alberta attack in a weekend sweep over the UBC Thunderbirds. After missing the 2017/18 season, Walsh returned to the Pandas by opening her season with 61 assists, 10 digs, and three aces in back-to-back wins for the Pandas in Vancouver. The fifth-year setter was tremendous on Friday night, finishing with 28 assists in a dominant 3-0 Alberta win. She then followed that up with another superb performance on Saturday, pacing the Pandas attack with 33 assists, while adding two kills, and six digs. From 2013-17, Walsh tallied 2,907 career assists, the most in Alberta women’s volleyball history. Walsh and the Pandas return to Edmonton this week, as they host the Mount Royal Cougars on Friday and Saturday nights in their home-opening series at Saville Community Sports Centre. Third-year Golden Bears striker Ajeej Sarkaria added to his already sparkling resume this past weekend, setting a new Canada West record with a five-point weekend in Calgary. With two goals and three assists for the Bears in their weekend sweep of Mount Royal and Calgary, Sarkaria became the Canada West all-time scoring leader. Through 41 career Canada West games, Sarkaria now has 60 points, three more than previous record holder Dominic Russo (Calgary, 2012-2016). The third-year Edmonton product paced the Alberta attack on Saturday against the Cougars, scoring the game-winner in the 45th minute, before assisting on two of Easton Ongaro’s goals in the second half. Sarkaria also added two points in the Bears win over Calgary on Sunday, leading the team to their 11th win. Sarkaria also now leads Canada West with 18 points in 13 conference games. He has led the conference in scoring in each of his first two seasons, being named a conference all-star twice. The Golden Bears have one conference game remaining - this weekend against MacEwan - before hosting a quarter-final match the following weekend at Foote Field. Following back-to-back shutouts this past weekend against the Mount Royal Cougars, senior Pandas soccer goalie Rebecca Reif has been named the Sherlock Holmes Athlete of the Week. Reif backstopped the Pandas to a 2-0 win on Saturday, and a 0-0 draw on Saturday, improving the Pandas to 8-0-2 in conference play. The fifth-year stopper made seven combined saves over the Pandas two matches, as she continues to lead Canada West in fewest goals against (3), while sitting second with a 0.914 save percentage. Her pair of clean sheets over the weekend also gives her seven this season, as she only trails Calgary's Lauren Houghton, who has posted eight. Reif has now tallied 19 career shutouts (11 with MacEwan, eight with Alberta), to jump into tenth place all-time in Canada West history. Reif and the No. 9 ranked Pandas will aim to close the gap behind Calgary (9-1-0) in the Prairie Division this weekend, as they travel to B.C. with games scheduled against Trinity Western and Fraser Valley this weekend. Sophomore Alberta Golden Bears striker Easton Ongaro has jumped atop the Canada West points race after torching both the Lethbridge Pronghorns and Saskatchewan Huskies this past weekend in Edmonton. Ongaro recorded six points in two Golden Bears wins, highlighted by a three goal, four point explosion against Saskatchewan on Sunday. The Edmonton, Alta. product now leads Canada West with 14 points, 10 goals, and 43 shots through 11 conference games. Ongaro paced the Alberta attack on Saturday, netting a pair of goals to lift the Golden Bears to a 3-0 win over the Lethbridge Pronghorns. He followed that up with his first hat-trick of the season in the second half against the Huskies, while also assisting on Ajeej Sarkaria’s game-winner. With the win, the 9-0-2 Bears have already clinched top spot in the Prairie Division of Canada West, with three regular season games remaining. After their ‘’bye’ next weekend, Alberta will head down to Calgary for matches against both Mount Royal and the Calgary Dinos. Continuing his record-setting career with the Golden Bears, fifth-year keeper Connor James added another pair of shutouts this past weekend in B.C, earning him the Sherlock Holmes Athlete of the Week award. James led the Bears with 13 combined saves over their two games, as Alberta earned a 1-0 win over Thompson Rivers and a scoreless draw against the Trinity Western Spartans. His standout performance came on Friday night against the WolfPack, as he made a season-high eight saves, including a handful of highlight reel stops in the second half. James now leads Canada West with a 0.881 save percentage, seven wins, and five clean sheets this season. The Edmonton product is also now just one shutout away from tying the Canada West record which is currently held by former Victoria Vike Dominic Butcher (1996-2000) with 28. James already holds the conference records for games played (62) and wins (43). James and the No. 8 ranked Golden Bears will return to Foote Field this weekend, as they host Lethbridge and Saskatchewan on Saturday and Sunday. Rookie Golden Bears running back Jonathan Rosery is the Sherlock Holmes Athlete of the Week following his stellar road performance against the Manitoba Bisons this past weekend. The first-year Bear tallied 142 rushing yards on 19 carries, while also adding his first career rushing touchdown in the Bears Week 3 loss in Winnipeg. The 142 yards Rosery accumulated were the second most in a single game by any back in Canada West this season, while his 19 carries represented a conference high this season. Through his first three career Canada West games, Rosery has 147 rushing yards on 20 carries, one reception for nine yards, and has returned six kickoffs for 90 total yards. His 246 all-purpose yards are the third most on the Bears, behind Dryden Kalesnikoff and Ben Kopczynski. The 0-3 Golden Bears will get the chance to earn redemption against Manitoba, as they host the 1-2 Bisons this Friday night at Foote Field. Scoring 12 of the Pandas 17 points in their season-opener, third-year Alberta Panda Ali Wicklum paced the Pandas to a 17-10 win over the Lethbridge Pronghorns, and has been named the UAlberta Sherlock Holmes Athlete of the Week. The 2017 Canada West all-star scored a pair of tries in the first half, while also adding a convert on her second major score, to lead the Pandas to their first win of the season. It’s also the first win for the Pandas since the 2016 season, after going 0-4 in conference play a year ago. The third-year Business student also played a crucial role in stopping the Pronghorns comeback late in the second half, adding a handful of key tackles inside their own 30 yard line. The game was also the first of two in the Ric Suggitt Cup, which honours the late coach who spent time with both rugby programs. Wicklum and the Pandas will head on the road for the next two weeks of the season, before returning to Foote Field on October 4th for a match against the Calgary Dinos. Third-year Golden Bear striker Ajeej Sarkaria paced the Alberta attack with a record-setting weekend, leading Alberta to a pair of road victories. The former Men’s Soccer Player of the Year set numerous records during a three-point weekend, as the Bears improved to 3-0-0 in conference play with wins over Saskatchewan and Lethbridge. Sarkaria broke the Alberta program scoring record with the first of his two goals on Saturday, eclipsing the mark of 44 points set by former Bear Brett Colvin (2007-2011). The third-year business student was also paramount in the Bears thrilling comeback win on Sunday over Lethbridge, scoring the game-winner in the 89th minute. The game-winner was the 11th of his career, which also set a new conference record. Following his dominant weekend, Sarkaria is now fourth all-time in Canada West scoring with 47 points (30 goals, 17 assists) in 31 career conference games. The Bears will host both Calgary and Mount Royal in their first two games at home this weekend. Fourth-year University of Alberta Golden Bear Stephane Legault is the Sherlock Holmes Athlete of the Week after leading the Bears to their record 16th University Cup title, this past weekend in Fredericton, New Brunswick. Legault recorded a tournament-leading seven points in three games in Fredericton, was named to the tournament all-star team, and was awarded the University Cup Tournament MVP. Legault recorded a point in each of the Bears three wins, including a five-point performance in Alberta’s 8-6 win over Acadia in the national quarter-final. The two-time University Cup Champion added another assist in the Bears 3-2 OT win over Saskatchewan in the semifinal. Legault was also tremendous in the national final against the St. FX X-Men, scoring the game-tying goal in the first period, after Alberta trailed St. FX 2-0 early in the opening period. Alberta’s national championship was their third in five seasons, after also winning back-to-back banners in 2014 and 2015. After another dominant weekend on the track, this time at the 2018 U SPORTS Championship at Windsor, sophomore Golden Bears sprinter Austin Cole is the Sherlock Holmes Athlete of the Week. This is also the second time in three weeks Cole has been named the University of Alberta's Athlete of the Week. After tearing up the Canada West championships in Winnipeg with a three gold medal, record-setting performance, Cole followed that up with three national gold medals, while setting a new U SPORTS record in the men's 300 meter dash. Cole began his remarkable weekend with the record-setting performance on Friday, breaking a 19-year old record in the men's 300m, surpassing the old record of 33.40 with a time of 33.37 seconds. Cole's time also set a new Dennis Fairall Fieldhouse record, and was his third time this season breaking the Bears program record, after he also set a new Canada West Championship record two weeks ago at 33.74. On the final day, Cole added another two gold medals, one in the 4x200m relay, and another in the 4x400m relay, before being named one of two co-Athletes of the Meet. Thanks to Cole's efforts, the Bears earned a national team silver medal, their best finish at the national championship since winning in 2001, and first team medal since earning a bronze in 2006. Sophomore University of Alberta Golden Bear sprinter Austin Cole is the Canada West first star of the week after leading the Bears to their 7th Canada West Championship title this past weekend in Winnipeg. Cole finished the conference championships with gold medals in the 300m dash, 4x200m relay, and 4x400m relay, helping the Bears win their first Canada West banner since 2006. For his efforts, Cole was also award the 2018 Canada West Male Track Athlete of the Year. Cole, the No. 1 ranked sprinter in Canada in the men’s 300m, cruised to his first gold medal in that event, finishing nearly a full second ahead of teammate Cam Snider. The Sherwood Park, AB product followed that up with strong performances in both the 4x200 and 4x400 relays, as the Bears narrowly edged the host Bisons in the 4x200, and the Huskies in the 4x400 for gold. Cole and the U SPORTS No. 2 ranked Golden Bears will look to duplicate their success in two weeks’ time, as they travel to the University of Windsor for the 2018 national championship. Fifth-year University of Alberta Pandas setter Eryn Orysiuk is the Canada West first star of the week after her record-setting performance led the Pandas to a weekend sweep of the Brandon Bobcats. Orysiuk finished with 66 assists, seven aces, ten digs and three kills as the Pandas finished their season with six-straight wins to jump into fourth in Canada West with a 15-9 record. Thanks to her strong weekend, the fifth-year Panda was also able to set new Canada West records for assists in a single season with 942, and a new program record for aces in a season with 47. Her new assist total surpassed the previous record held by former Trinity Western Spartan Nikki Cornwall, who set the previous record of 920 in 2015/16. The Edmonton, AB product finished with game-highs of 33 assists in each of the Pandas 3-0 wins over the Bobcats, with her strongest performance coming on Saturday, as she also added three aces and seven digs. Orysiuk and the No. 4 Pandas will host the No. 5 Trinity Western Spartans in a Canada West quarter-final series this weekend at Saville Community Sports Centre. Rookie University of Alberta Golden Bear Jordan Wong is the Canada West first star of the week after leading the host Bears to the 2018 Canada West Wrestling Championship. The U SPORTS top-ranked wrestler in the 54 kg class went a perfect 4-0 during the two-day competition, winning the men’s 54 kg weight class, helping the Bears capture their record 11th Canada West title. Because of his stellar weekend, the Calgary, AB product was named the 2018 Canada West Male Rookie of the Year. Wong was one of four Bears to capture gold medals in their individual weight class, and the only rookie. The Canada West first place finish is his third gold medal and fourth podium finish this season, to go along with golds at the Dino Invitational and Golden Bears Open. Wong and the U SPORTS No. 1-ranked Golden Bears will look to add another banner in two weeks’ time, when they travel to Algoma University for the 2018 U SPORTS Championship. University of Alberta Golden Bear Track and Field stars Spencer Allen and Wesley Calef have been named the Sherlock Holmes Athletes of the Week following a pair of record-setting performances this past weekend in Winnipeg. Both Allen and Calef added to their already stellar seasons, breaking the University of Alberta program records in their respective disciplines at the 2018 University of Manitoba Bison Open. Allen set the new Golden Bears record in the Men's Pole Vault, jumping a height of 5.20 meters, breaking the record set by current Bear Nathan Filipek (5.16 m - February, 2016). Allen's jump was also the highest in Canada this season, ten centimeters more than Filipek's jump of 5.10m. Allen is a two-time U SPORTS medalist in the pole vault, including a gold medal last year at the Championships held in Edmonton. Calef, meanwhile, set the new Bears record in the Men's High Jump, winning the Bison Open competition with a jump of 2.11 meters. His jump broke one of the oldest records in Bears program history, which was previous set at 2.10m by Danny Lanavas in 1984. Calef's mark of 2.11 is also the second highest jump in Canada this year, behind only Guelph Gryphon Sean Cate's jump of 2.16. Both Allen and Calef will lead the No. 2 ranked Golden Bears at the Canada West Championships in two weeks (Winnipeg), before traveling to Windsor for the 2018 U SPORTS Championship. 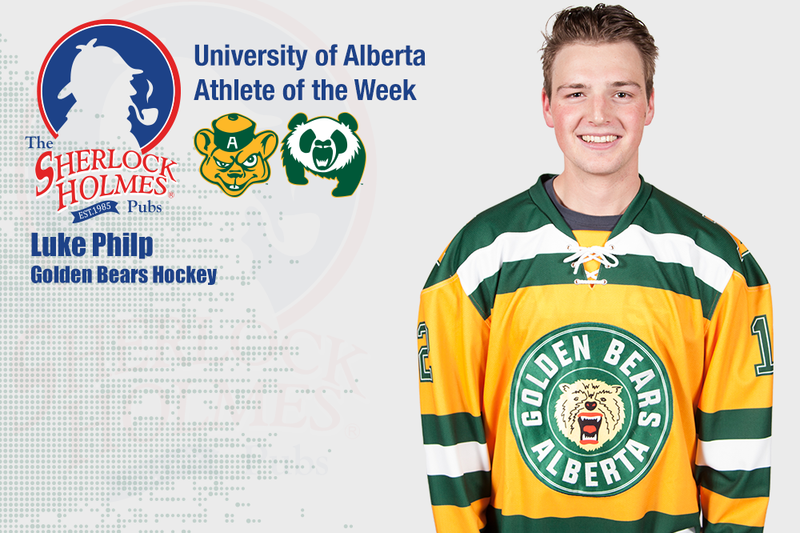 Rookie University of Alberta Golden Bear Steven Owre is the Sherlock Holmes Athlete of the Week after scoring four goals in a two-game sweep of the Lethbridge Pronghorns. The Golden Bears outscored the ‘Horns 17-3 in two games, with four of the goals coming off the stick of the first-year Bear. Following the stellar weekend, Owre has jumped into tenth in Canada West with 23 points in 24 games, while leading all rookies in goals (14) and points. The California product continued his second half tear with a pair of goals in Friday night’s 8-1 road win over Lethbridge, and followed that up with another two-goal performance on Saturday. Owre now has eight goals and ten points over his last six games. The conference-leading Golden Bears (20-3-1) will look to clinch first place in the conference this weekend, as they host the second place Saskatchewan Huskies (18-5-1) at Clare Drake Arena. Third-year University of Alberta Panda Autumn MacDougall is the Sherlock Holmes Athlete of the Week after adding to her conference lead with five points in a weekend sweep of the Regina Cougars. The U SPORTS No. 1 Pandas shutout the Cougars in back-to-back nights, thanks to one goal and four assists from the conference’s leading scorer. MacDougall leads Canada West with 11 goals and 25 points in 22 games - seven more points than the second highest scorer. 13 of MacDougall’s points have also come during her current six-game point streak, which began at the start of the second semester. The third-year Panda recorded a point on all three of the Pandas goals in their 3-0 win on Friday night, assisting on each of Alex Poznikoff’s goals in the first period, before adding a goal of her own in the third. She then backed that up with another multi-assist performance, this time in a 5-0 Alberta win over Regina on Saturday. The 11-4-4-3 Pandas will put their five-game win streak on the line this weekend, as they host the Lethbridge Pronghorns to Clare Drake Arena on Friday at Saturday. Fifth-year University of Alberta long distance runner Kieran McDonald is the Sherlock Holmes Athlete of the Week after his record-setting performance this past weekend in Seattle. McDonald set a new Golden Bears program record in the men's 3000 meter race, completing the event with a time of 8:16.90. The time eclipses the mark set by McDonald's teammate, and current Golden Bear Royden Radowits, who set the previous mark of 8:17.56 11 months ago on the same indoor track at the University of Washington. McDonald's time is also the fastest this year in Canada, less than one second faster than Guelph Gryphon Connor Black. McDonald was one of eight UAlberta Track and Field Athletes who traveled to Seattle for the University of Washington's Huskie Indoor Preview meet. In total, along with McDonald's record-breaking run, 32 personal bests were set this past weekend by Golden Bears and Pandas athletes in Washington and at the University of Saskatchewan's Sled Dog Open. The conference's best Track and Field athletes will now travel to Edmonton this weekend, as the University of Alberta hosts the 49th Annual Golden Bears Open, Friday and Saturday in the Universiade Pavilion. Third-year University of Alberta Golden Bears forward Brody Clarke is the Sherlock Holmes Athlete of the Week after leading the U SPORTS No. 5 ranked Bears to a weekend sweep of the No. 2 ranked Calgary Dinos. Clarke was tremendous at both ends of the floor in the home-and-home series, recording a combined 38 points, 28 rebounds, and six assists, while shooting 50% from the field. The 2016 Canada West Rookie of the Year finished with a game-high 21 points in the Bears 92-79 win in Calgary on Thursday, while also adding 10 rebounds, six of which were offensive, and adding a pair of assists. Clarke was just as dominant on Saturday, adding another 17 points on 6/10 shooting, while pulling in a season-high 18 rebounds in the win. Another six of Clarke’s 18 rebounds were offensive, as the Bears out-rebounded Calgary 49-29 in the ten-point win. The Golden Bears, who now sit atop Canada West with an 11-1 record, will host the 8-4 Regina Cougars this weekend at Saville Community Sports Centre in Edmonton. Fifth-year Pandas volleyball setter, and team captain Eryn Orysiuk is the Sherlock Holmes Athlete of the Week after leading the nationally ranked Pandas to a sweep of of the visiting Thompson Rivers WolfPack, this past weekend at Saville Community Sports Centre. Orysiuk was equally superb in each of the Pandas wins this weekend, as the perennial power Pandas moved back above the .500 mark in conference play, as they enter the winter break with a 7-5 record. The veteran Pandas setter, who is back in her natural position after spending last season as their libero, recorded 71 assists, 20 digs, and eight aces in the two Pandas wins. Orysiuk, a product of the Pandas Volleyball Club, recorded at least 30 assists in each of the two matches, highlighted by a 37 assist performance in the Pandas 3-1 win over the WolfPack on Sunday. She also added a team-high four aces and 15 digs, leading the Pandas to the series sweep. Entering the winter break, the Edmonton native now sits second in Canada West with 10.00 assists per set this season, third with 27 aces, while leading the conference with 480 total assists. The Pandas will resume conference play in January, as they visit the UBC Okanagan Heat (Jan. 5/6), and the MRU Cougars (Jan. 12/13), before returning to the Saville Centre on January 19th for a series against the Calgary Dinos. Fifth-year Golden Bears basketball forward Mamadou Gueye is the Sherlock Holmes Athlete of the Week after leading the Bears to a weekend sweep of the Saskatchewan Huskies at Saville Community Sports Centre. Gueye was stellar in the Bears series-opening 78-65 win over Saskatchewan on Friday. He finished with a game-high 19 points on 7/14 shooting, while also adding 15 rebounds, three blocks, and one assist. The double-double was his first of the season, with his 15 rebounds a new season best. The Quebec City, QC product was just as impact on Saturday, adding another 12 points, five rebounds, four assists, and three steals in just 22 minutes. With the dominant 100-54 win over the Huskies, the Bears improved to a perfect 8-0 this season, and are the only remaining undefeated team left in Canada West. Gueye and the conference-leading Bears will be back in action this weekend, as they host the 4-4 Victoria Vikes on Friday and Saturday night. Following back-to-back outstanding performances against the Saskatchewan Huskies at home, sophomore Pandas goalie Kirsten Chamberlin is the Sherlock Holmes Athlete of the Week. Chamberlin made 49 combined saves on 51 shots, as she led the Pandas to a weekend sweep of the previously top-ranked Huskies at Clare Drake Arena. The sweep gave Alberta their seventh and eighth wins of the season, and moved them into second place in Canada West with a 6-2-2-2 conference record. The second-year goalie stopped 16 of 17 shots she faced on Friday night, as the Pandas knocked off the Huskies 3-1. She was even better on Saturday night, turning in a 32-save performance, earning the games First Star, and leading the Pandas to their second-straight 3-1 win over Saskatchewan. The U SPORTS No. 1 Pandas will head on the road this weekend, as they face the 8-4-0-0 UBC Thunderbirds in Vancouver. Both Friday and Saturday's games will be available to fans on Canada West TV. Fifth-year Pandas forward Elle Hendershot is the Sherlock Holmes Athlete of the Week after leading the nationally ranked Pandas to a pair of road wins over the UBC Okanagan Heat. Hendershot recorded a combined 29 points, 39 rebounds, five assists, three steals, and two blocks as the Pandas improved to 5-1 in conference play. Following the monster weekend for Hendershot, the veteran Panda now leads Canada West and U SPORTS in rebounds, with 81, and rebounds per game with 13.5. The highlight of Hendershots weekend came on Friday night, as she recorded one of the biggest double-doubles in program history. The Lubbock, Texas product scored 19 points on 5/7 shooting, while adding a program-record 23 rebounds in the Pandas 67-60 win. She followed that up with another dominant performance, recording her fourth double-double of the season with 10 points and 16 rebounds. The No. 7 ranked Pandas will have their first ‘bye’ of the season this weekend, before hosting the Saskatchewan Huskies in Edmonton on November 24th and 25th. 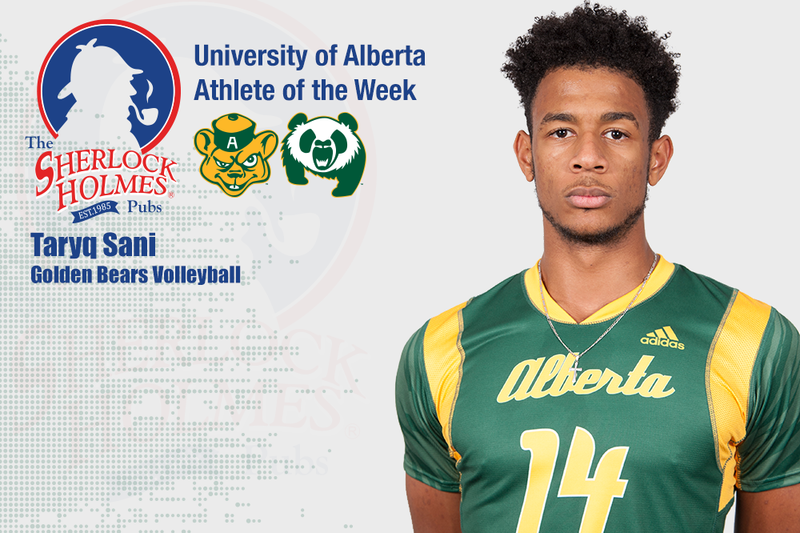 Following back-to-back stellar performances on the road against Regina, sophomore University of Alberta Golden Bears outside hitter Taryq Sani is the Canada West First Star of the Week. Sani led the Bears to a pair of wins over the Cougars, as the No. 8 ranked Bears improved to 4-0 in conference play. The second-year hitter finished with 47 kills, 25 digs, and three aces in the two-game sweep of Regina. Sani also now leads Canada West with 4.88 kills per set this season. The 2016-17 Canada West All-Rookie team member was sensational in Friday night’s four-set win, finishing with a career-high 24 kills on 39 attempts, while also adding a game-high 12 digs. Saturday’s match was no different, as he finished with a game-high 23 kills, 10 more than any other player. Sani also added another 13 digs, to go along with an ace and an assist. The undefeated Bears will look to stay atop the Canada West standings this weekend, as they host the 1-3 Manitoba Bisons at the Saville Centre on Friday and Saturday night. Fifth-year Golden Bears wide receiver Tylor Henry is the Sherlock Holmes Athlete of the Week following a massive performance in the Bears Week 8 win in Calgary. Henry hauled in nine catches for 159 yards, four of which went for touchdowns, as the Bears shocked the No. 1 ranked Dinos 53-3. Henry's four TD catches were the most in a single game in Golden Bears history, and the second most in Canada West history. Henry set the Canada West record for career receptions earlier in the season, while finishing second all-time in receiving yards. The Winnipeg Blue Bombers draft pick played a central role in helping the Bears clinch their first post-season berth since 2010, as the Bears earned their first on-field victory over the Dinos in nearly a decade. The last win for Alberta in Calgary came in 2007, while their last non-forfeit win came in 2008. The Golden Bears will once again visit the Dinos this week, as the U of C hosts one of two Canada West semifinals at 1:00 p.m. on Saturday. Fourth-year University of Alberta Golden Bears hockey defenceman Dylan Bredo is the University of Alberta Sherlock Holmes Athlete of the Week after leading his Bears to a series sweep of the nationally ranked Calgary Dinos. Bredo scored his first three goals of the season over the weekend, including the overtime winner on Saturday, while adding an assist on Friday night for the four-point weekend. The Edmonton product was tremendous in the series opener on Friday night in Calgary, as the veteran D-Man scored twice and adding an assist as the Bears earned a thrilling 7-5 win over the Dinos. Bredo capped off the strong weekend with his third goal of the season on Saturday, sniping a shot over Jordan Papirny in overtime to give Alberta the series sweep. The No. 2 ranked Golden Bears, who still own an undefeated 6-0-0 record, will but their perfect record on the line this weekend, as they visit the Regina Cougars. 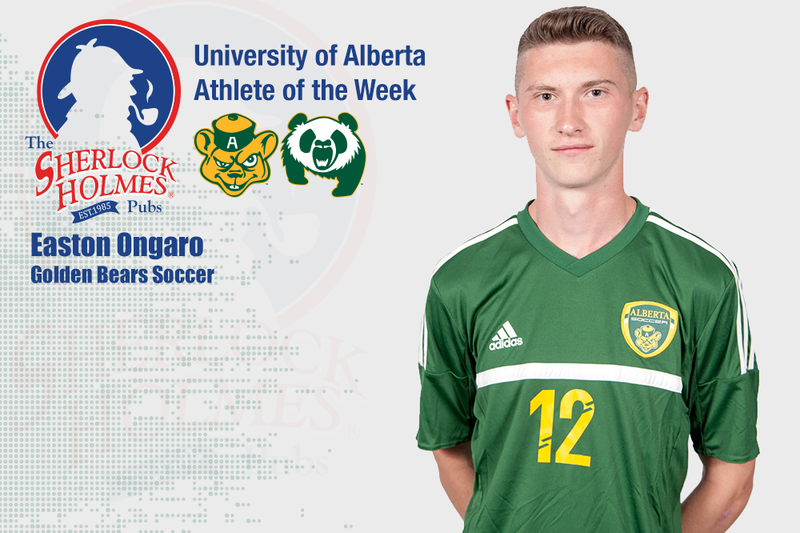 Rookie University of Alberta Golden Bears soccer forward Easton Ongaro is the Sherlock Holmes Athlete of the Week following his four-point performance in a weekend sweep of the MacEwan Griffins. Ongaro led the Bears with three goals and four points, as the Bears earned a pair of decisive wins over their cross-town foes this past weekend. The pair of wins also clinched the Prairie Division for Alberta, who now own a 9-1-2 record in 2017. Despite playing just 54 minutes on Saturday, Ongaro was an offensive catalyst for the Bears. The rookie Bear scored two goals 14 minutes apart in the first half, the second and third goals of his young career. Ongaro was just as dynamic on Sunday at Foote Field, finishing off a nice feed from Ajeej Sarkaria in the box for his third goal of the weekend, before setting up Sarkaria for his third assist of the season. Sophomore Golden Bears hockey forward Luke Philp is the Sherlock Holmes Athlete of the Week following his six-point performance on opening weekend. Pegged as head coach Serge Lajoie’s 2017-18 Player to Watch, the Golden Bears sophomore took little time proving why, recording six assists in the Bears opening weekend sweep over the Mount Royal Cougars. Philp was easily the best player on the ice in Friday night’s 7-0 win over the Cougars. The Canmore, AB native recorded a career-high four assists, including setting up each of the Golden Bears first three goals, highlighted by a two-on-none shorthanded breakaway, which was finished off by Jamie Crooks. Philp was just as strong on Saturday in Calgary, adding another two assists in the Bears 5-1 win over Mount Royal. His six points are the most in Canada West after two conference games, while his +6 rating is also a conference-high. Philp and the undefeated Golden Bears will be back at Clare Drake Arena this weekend, as they host the 1-1 Manitoba Bisons on Friday and Saturday night. 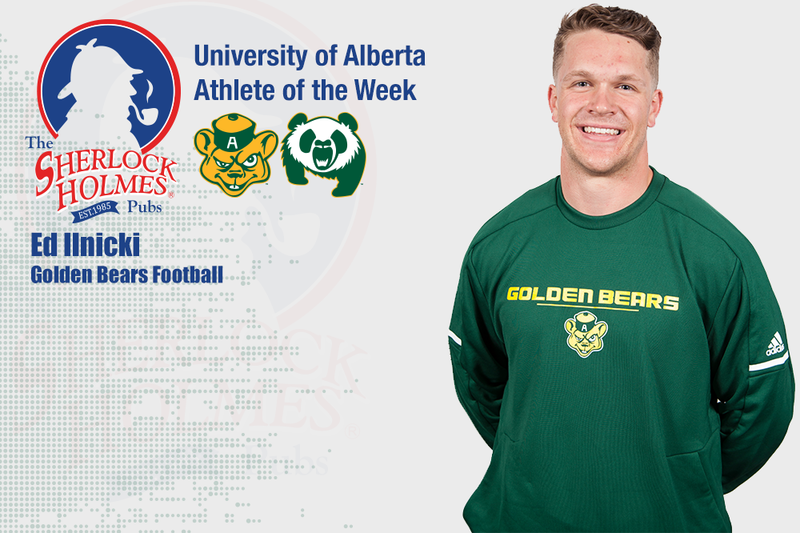 For the second-straight week, fifth-year Golden Bears running back Ed Ilnicki is both the University of Alberta's Sherlock Holmes Athlete of the Week and Canada West Football's Offensive Player of the Week. Ilnicki was tremendous on Friday night, rushing for 278 yards on 44 carries, while adding five catches for 63 yards, adding his sixth rushing score in the Golden Bears 36-25 win over the Manitoba Bisons in Winnipeg. Fifth-year running back Ed Ilnicki is the Sherlock Holmes Athlete of the Week following his offensive explosion this past weekend against UBC. Ilnicki carried the ball 22 times for 196 yards, scoring all three of the Golden Bears touchdowns this past Saturday in the Bears 41-21 loss. For his efforts, he was also named Canada West Football's Offensive Player of the Week. The veteran back now leads Canada West with 551 rushing yards through four games this season, 156 more than UBC's Ben Cummings. His five touchdowns are also tied for the most in Canada West. With his 22 carries on Saturday, Ilnicki was also able to pass Nathan Connor for the second most carries in Golden Bears program history (561). Ilnicki capped off the Golden Bears first drive of the game against UBC with a 15-yard TD scamper his third major of the season. He followed that up with the highlight of his afternoon, cutting through the UBC defence for a 46-yard touchdown in the second quarter. Fifth-year Pandas soccer defender Jamie Pasemko is the Sherlock Holmes Athlete of the Week following her tremendous performance in the Pandas season-opening weekend. Pasemko's play helped the Pandas obtain four of a possible six points against the Calgary Dinos and Lethbridge Pronghorns. Pasemko, who was recently named captain of the Pandas, led them both offensively and defensibly in Saturday's 1-0 win over the U SPORTS No. 7 ranked Dinos. The Edmonton, AB native assisted on the lone Alberta goal, sending in a beautifully executed set piece into the Dinos box, before rookie Georgia Tansley netted her first career goal. The veteran defender was also responsible for a pair of saves inside her own crease, saving keeper Cassie Bazzarelli with a pair of foot-saves on the goal line. Pasemko was just as solid on Sunday, exhibiting poise and creativity throughout the match, however, the Pandas were unable to capitalize on their chances in a 0-0 draw. Pasemko and the 1-0-1 Pandas will return to the pitch this weekend, as they visit the undefeated MacEwan Griffins and the UNBC Timberwolves. 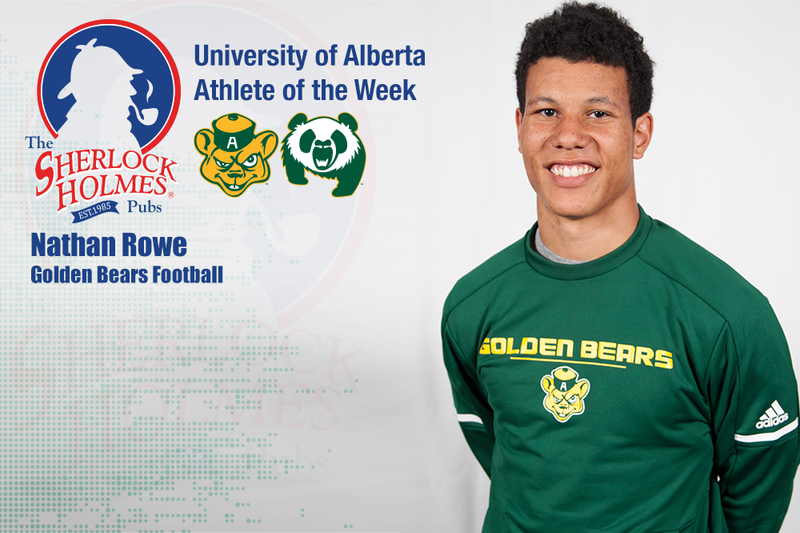 First-year University of Alberta Golden Bears football receiver Nathan Rowe is the Sherlock Holmes Athlete of the Week following his stellar debut this past weekend. Rowe hauled in seven catches for 208 yards and a touchdown on Friday night's loss to the Calgary Dinos. Rowe was a the favourite target of Bears QB Brad Baker, who found the rookie receiver four times for 25 yards in the first half. However, the Calgary, AB native exploded in the second half, hauling in two massive catches totaling 164 yards. The first, in which the Bears were pinned deep in their own territory, went for 55 yards, and led to a Golden Bears 30-yard field goal. However, the highlight of Rowe's performance came late in the fourth quarter, as he hauled in a record-breaking 109-yard TD reception. The reception was the longest in Golden Bears history, and tied a 16-year old Canada West record, held by current Seattle Seahawk Jon Ryan. Rowe and the Golden Bears will be back in action this weekend, as they visiting the 1-0 Saskatchewan Huskies on Friday night. The game will be available on both Canada West TV, as well as TELUS Optik TV. 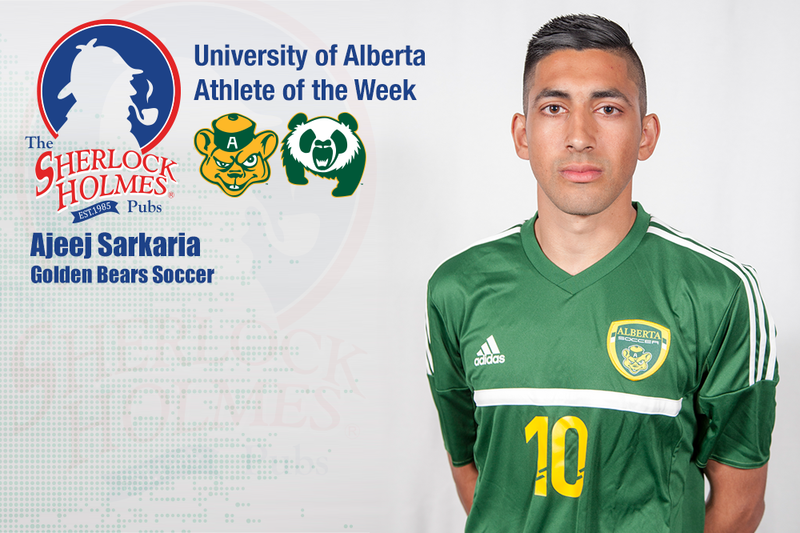 Sophomore University of Alberta Golden Bears striker Ajeej Sarkaria is the Sherlock Holmes Athlete of the Week following his four-point weekend. After one of the single greatest seasons in Canada West Men’s Soccer history - in which he led the conference with a record 19 goals – Sarkaria showed last season was no fluke with another dominating weekend in Calgary. The Edmonton native powered the No. 1 ranked Golden Bears to a hard fought 1-0 win over the Mount Royal Cougars, with his 39th minute penalty kick standing as the game-winning-goal. Sarkaria was even more spectacular on Sunday against the Calgary Dinos, as his three points led the Bears to a convincing 5-0 win over their rival. Sarkaria scored his second of the season in the 12th minute, before assisting on Tolu Esan’s second of the match in the 43rd minute, and earning the helper on Ajay Khabra’s tally in the 47th. Sarkaria, along with Trinity Western Spartan Leighton Johnson, hold the tie for the conference scoring crown with four points each after two matches. The Golden Bears will return to Foote Field this weekend, as the host the Lethbridge Pronghorns in the home-opener on Saturday, and the Saskatchewan Huskies the following afternoon.